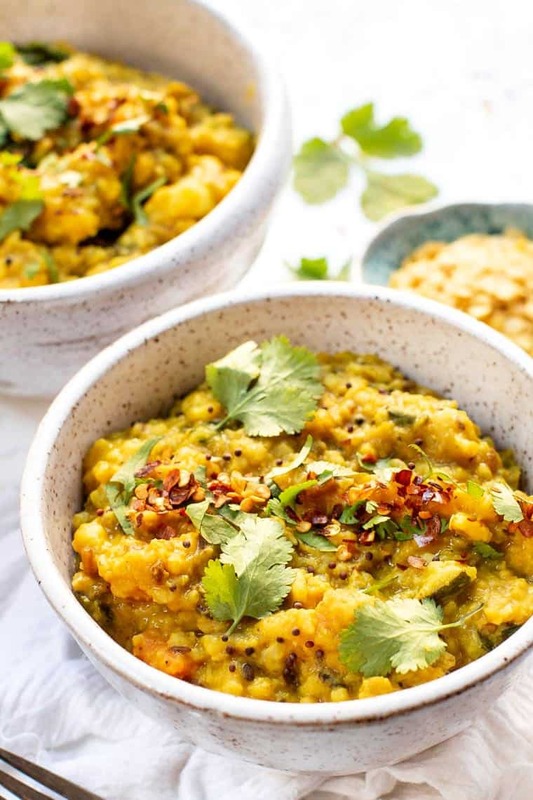 Learn how to make kitchari, a traditional ayurvedic recipe that is gentle on digestion, packed with fiber and flavor, and great for balancing your doshas. You guys, we're on a major roll with this gut healing kick. As you might remember, the start of 2019 was all about gut health for me. It was about resetting my system, getting back on track and nourishing my digestive system. 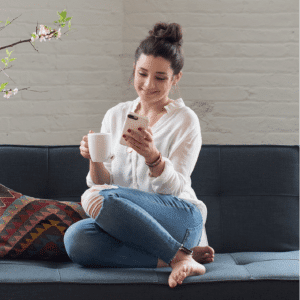 The first thing I did was follow my own 21-day reset protocol in my Simply Nourished program. Once those 21 days were up, I started focusing on making recipes that would be easy on the system, incredibly gentle, but also delicious. 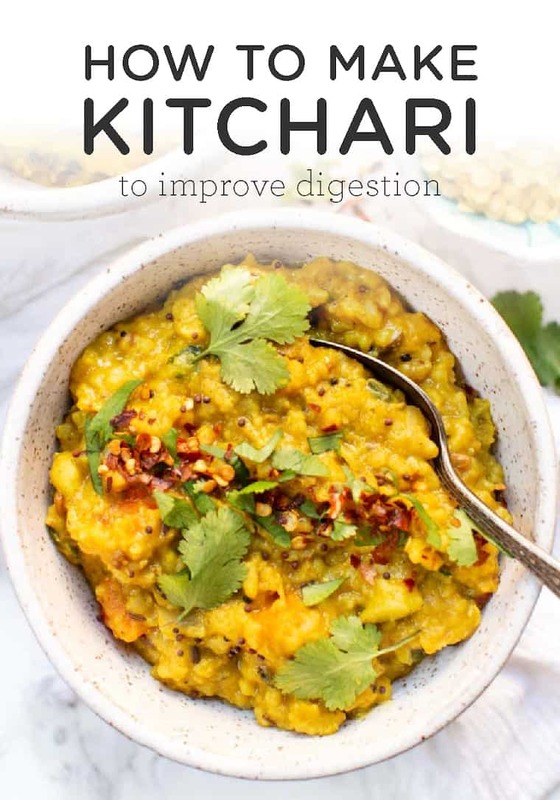 A few of my staples so far: vegan bone broth, turmeric carrot soup, kimchi fried quinoa and now this incredible kitchari recipe! First, let's talk about what the heck kitchari even is. 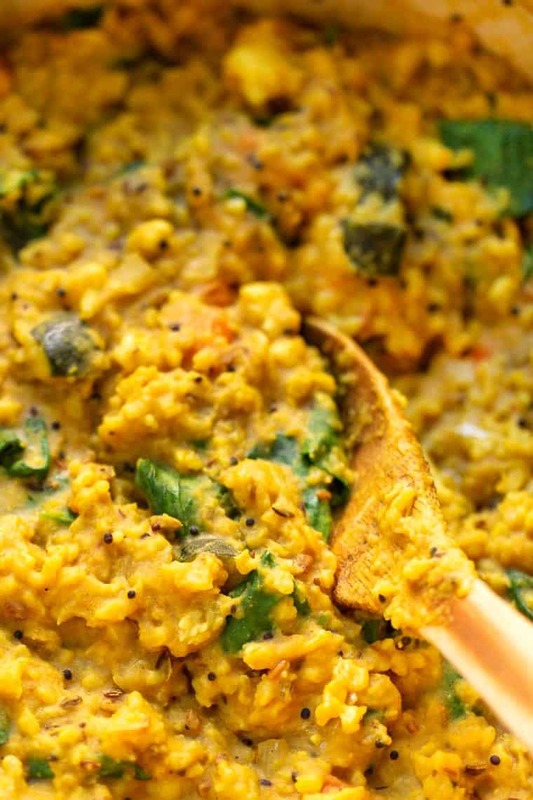 Kitchari is a dish used in ayurvedic cooking and is a staple in this way of life. It's made from a blend of basmati rice and mung dal and is designed to be very gentle on digestion. 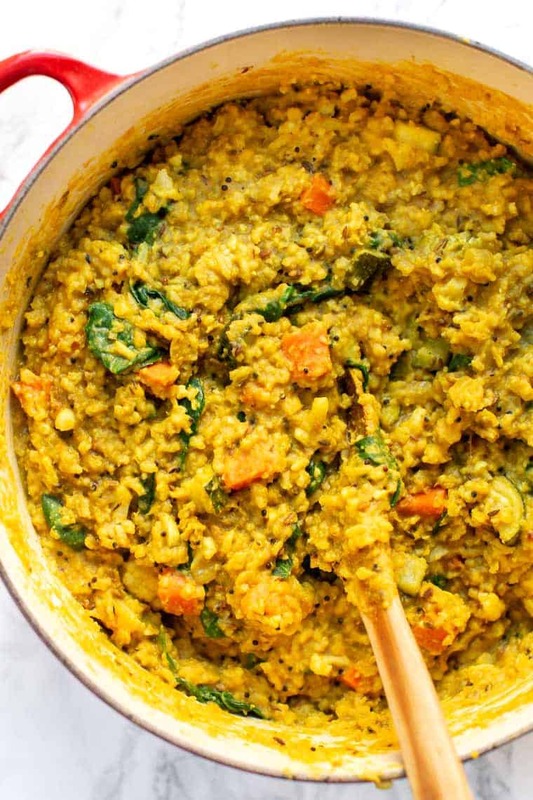 Kitchari can be made many different ways and has references dating back thousands of years. What Spices Should You Use in Kitchari? 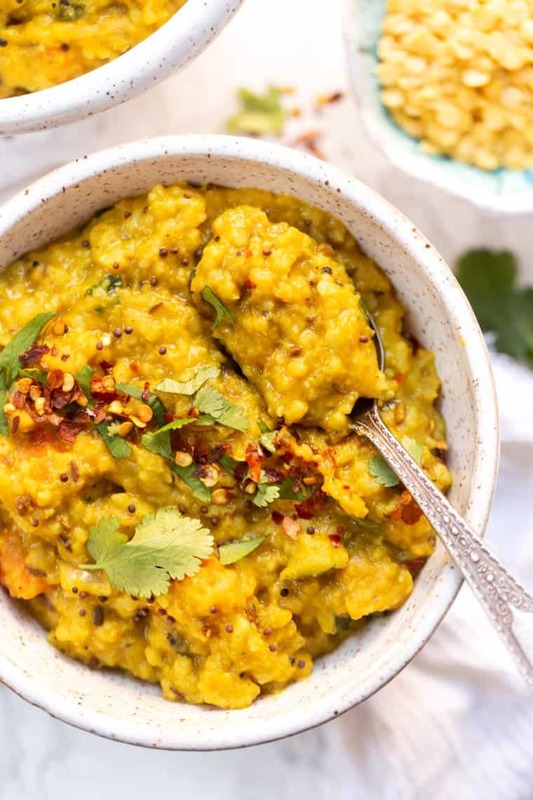 Ayurveda originates in India and thus like many other Indian-inspired recipes, kitchari is full of spices. The unique blend of spices used in kitchari is there to not only add flavor but also again balance out the doshas. There are warming spices, detoxifying spices, anti-inflammatory spices, and the blend is just delicious. The other secret to using spices in your kitchari is that you want some of them to be whole spices. 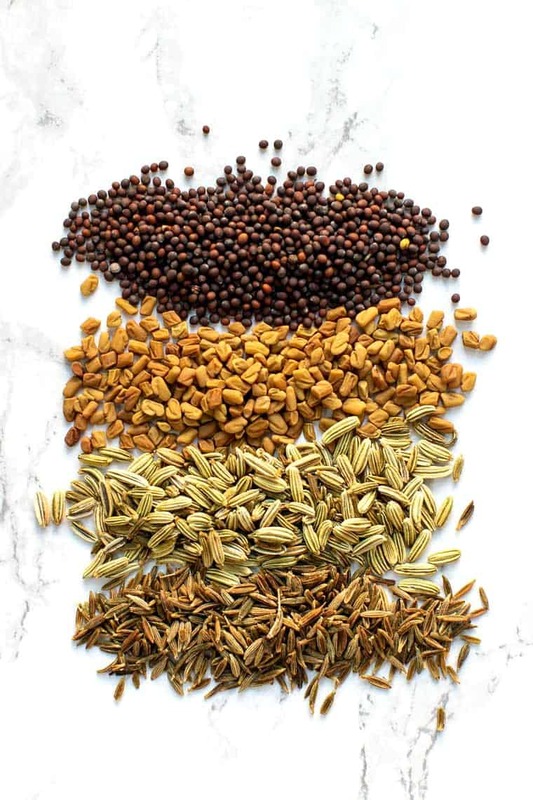 You'll notice in the recipe that we're using whole mustard seeds, fennel seeds, cumin seeds, and fenugreek and that's because whole spices retain more freshness and more flavor. 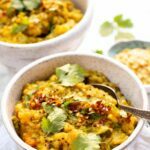 In the Western world, kitchari has been gaining a lot of popularity and I think it has to do with the Kitchari Cleanse. We seem to love anything having to do with cleansing, so whenever there's a new cleanse out, people jump on board! While I'm not personally a fan of doing big cleanses – especially juice cleanses – I can see why this particular one would be beneficial. First off, you're eating real food. Secondly, you're eating tons of fiber. And thirdly, everything is nourishing and healing for the gut. Pretty straightforward, not too hard to follow and again, you're actually eating. Check out my 3-day juice cleanse experience to see why I'll probably never do one of those again! What you're going to love about this recipe, aside from the awesome flavors, is how easy it is to make. You just need one pot and most of the cooking time is completely hands off. You start by sauteing the spices in a little coconut oil to boost their fragrance and enhance their flavor, then add in your rice, dal, veggies of choice and some liquid. Cook it for about an hour and you're good to go. It's seriously that easy! And best of all, since it's plant-based based and it's a sort of stew, kitchari is great for meal prep or freezing. 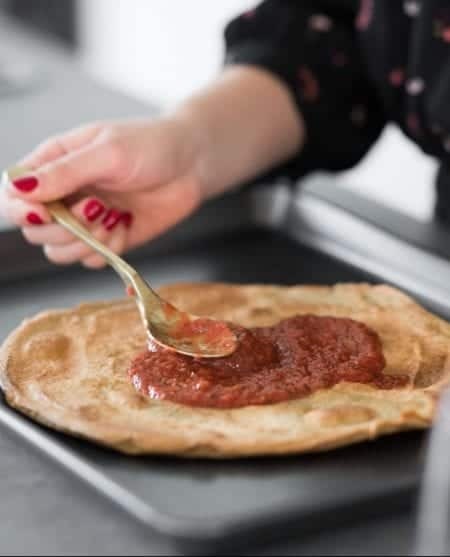 You can make a big batch (like this recipe), keep it in the fridge for days and just heat it up whenever you're ready to eat it! And as I said earlier, it's great for your gut. 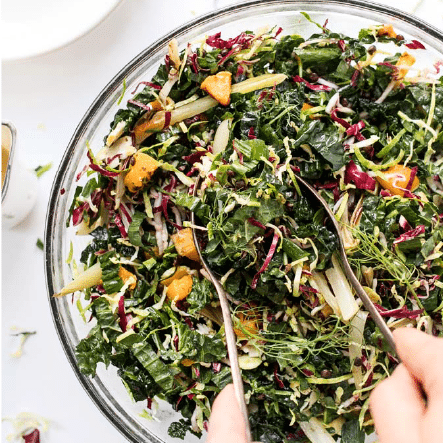 I don't get any gas or bloat with this recipe, it helps me get regular and I never get sick of the flavor. I love serving it with a dollop of coconut yogurt, some cilantro and pepper flakes. SO GOOD! 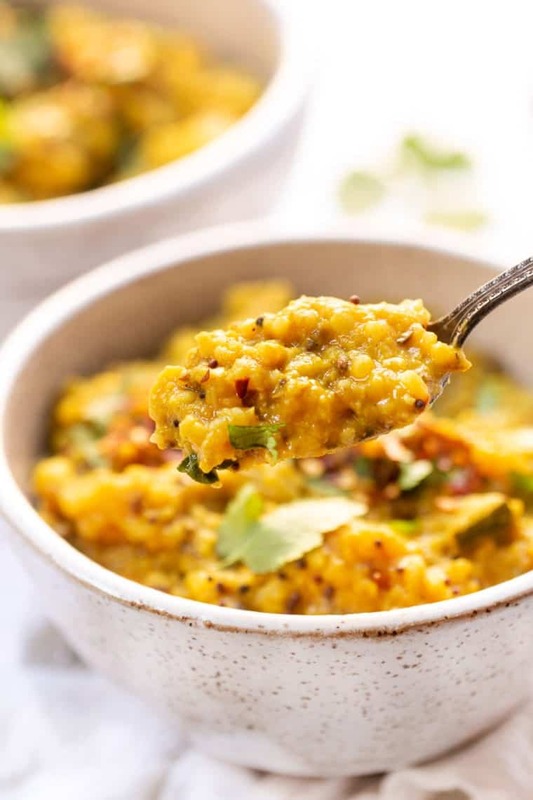 Learn how to make kitchari, a traditional ayurvedic recipe that is gentle on digestion, packed with fiber and flavor, and great for balancing out your doshas. Heat the oil in a large stockpot or dutch oven. Once melted, add the spices. Cook the spices in the oil until they start to become quite aromatic, about 2 - 3 minutes. From there add the garlic and onion/shallots and cook another 2 minutes or so. Add the beans, rice and veggies and give it a quick stir to ensure the spices are evenly coating the rest of the ingredients. Pour in the liquids and stir in the bay leaves. Bring the mixture to a boil, then reduce to simmer and cover and cook for about an hour. Remove the lid, give the mixture a good stir and add a touch more liquid if desired. When ready to serve, portion out between bowls. Top with cilantro and coconut yogurt if desired. 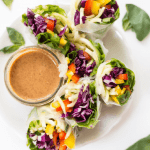 * for this recipe, you can use any blend of veggies! I did 1 cup each of carrots, zucchini, cauliflower and spinach. Use any blend you like, but try to avoid nightshades! I’m so excited to try this recipe tonight! I just realized (being a total newbie) that the mung beans bag say they should be soaked overnight. I definitely missed this step, is it necessary or do they cook up just fine in the kitchari without a pre-soak? Thanks! Update: I chickened out and just bought some split Moong Dal beans, and with no prior soaking they worked perfectly. I loved this recipe. I used broccoli, zucchini, carrots and Definitely a mushy dish, lol, but the aromas in my kitchen were gorgeous and the flavors were unique. I preferred it with the coconut yogurt mixed in and I added salt after it was cooked because I completely missed adding the sea salt in during cooking. My gut was happy too, no bloating or discomfort after eating. i’m having this for lunch, too. I’m so so glad you enjoyed it!! Love the additions you made 🙂 And it really does make the best lunch! I can’t wait to make this when I’m back from my trip in Mexico 🙂 It’s one of my favorites! Hi would mung beans work (not split) as they are all I have? Emma, I’m curious if you tried these and they worked! I haven’t tested it, so I’m not totally sure! Hi Alyssa, I made the Kitchari yesterday and it is amazing! I knew it would be the kind of dish I would like. Our local YMCA has a kitchen where they host lots of demos and cooking classes. They had a woman from Bangladesh cook some Daal Lentil soup and a chicken curry, both were awesome! So when I saw this recipe, I knew I had to try it. Only problem is that mine came out very mushy, maybe I cooked it too long? I cooked it for an hour. But it was still edible and very delicious, I will be eating it all week for lunch! The rice used in khidchdi(that’s what it is called) is the local variety and not usually basmati. Basmati is not very digestion friendly. Options of rice to be used could be Kolam or Sona Masuri. Hi. Instead of rice we can take same amount of broken wheat/ creaked wheat to make it more healthy and full of fiber. In india we call it khichadi. I haven’t tried that as I don’t eat wheat. They use white rice because it’s very easy to digest, but feel free to try another grain! Please note the serving size for the nutritional information. I see your recipe makes 8 servings. What is the size of a prepared serving?